It is barely possible to see the parasitic worm Amakusaplana acroporae when it sits on its favorite hosts, the staghorn coral Acropora, thanks to its excellent camouflage. However, new research from the University of Southampton has found that the small flatworm could cause significant damage to coral reefs. The flatworm has been scientifically described very recently and has been found in the wild only in one location on the Great Barrier Reef so it's surprising it the Reef has made it this long. The flatworm is well known to aquarium hobbyists, who keep staghorn corals and fear infestations of the parasite, since it can wipe out cultures within a short period of time. Professor Jörg Wiedenmann, Professor of Biological Oceanography and Head of the University's Coral Reef Laboratory, says, "The biology of this worm is amazing. 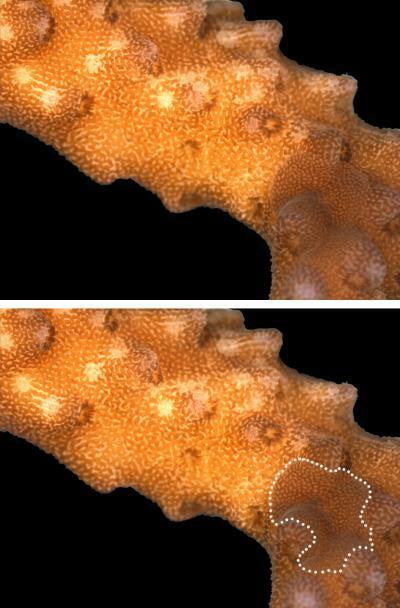 By using molecular biological techniques, we found out how the worm accomplishes this excellent camouflage: When eating the coral tissue it also takes up the symbiotic alga of the coral. Instead of digesting them completely, it keeps a certain number of them alive and distributes them in its guts so that it perfectly mimics the appearance of the coral. Moreover, it also incorporates the green fluorescent protein pigments that lend the glowing greenish colouration to the coral host to perfect its camouflage." "At the moment, there are no known natural predators of this parasite and only consequent quarantine can efficiently control its spread in land-based coral cultures. 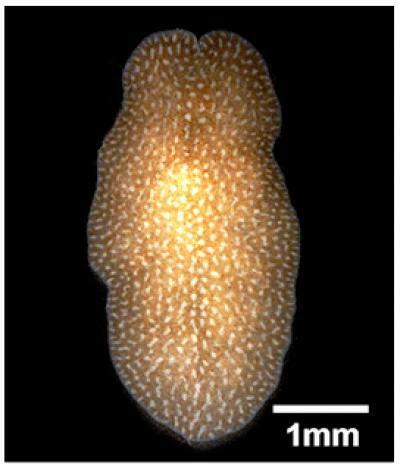 The worm is already distributed in coral cultures all over the word including regions bordering coral reefs. We do not know whether the parasite occurs naturally in these reefs and if it is controlled by natural enemies there. If this is not the case, a release of the parasite into an environment which is not adapted to its presence might have unforeseeable consequences for the regional Acropora populations," said Wiedenmann. "It is important to continue to raise the awareness among aquarium hobbyists that tank inhabitants should never be returned to the wild, since this might unintentionally contribute to the spread of parasites and diseases. Moreover, the hosts of these parasites themselves – corals, fishes and seaweeds – can create dramatic problems for ecosystems to which they are non-native. The spread of the lionfish Pterois through the Caribbean or of Caulerpa algae through the Mediterranean Sea are examples of marine invasions by ornamental species. It would be good if every shop were obliged to take the animals that they have sold back if requested – that would certainly reduce the risk of people releasing ornamental creatures in the wild when they feel that they cannot take care of them anymore," Wiedenmann concluded.